As soon as the house sells we can begin the quest for our floating home. There are lots of solid boats out there and we plan to find the one that best suits our needs, with minimal re-fitting. 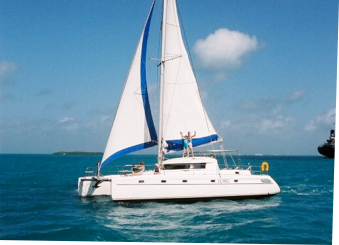 We know it will be a catamaran - between 38 and 42 feet with 4 cabins and 2 heads (bathrooms). There are also other requirements like a water maker, generator and if Michelle is lucky a tiny washing machine. Wouldn’t that be luxury! We will start the adventure somewhere in the Gulf, most likely Florida - it mostly depends on where the boat is found. Then we learn everything about our boat - all of us! In November, Geoff intends to find a spot as a crew member on a cross Atlantic sailing race. A good way to gain 20+ days of serious blue water experience. During this phase we will eventually be relocating onto the boat wherever we decide to make a home base. We will also be spending a lot of time in the St. Louis area to be close to Alec. This is similar to the kind of boat we will be looking for.